If you've never eaten pickled watermelon, be sure to try - it's delicious! The more that cooking them is not difficult, because salting to handle even inexperienced hostess. one spoon in each jar. First prepare the jars. Wash them thoroughly baking soda to remove grease particles and dust. Then rinse with cold water and sterilize over steam for 5-10 minutes. Watermelon wash brush, rinse with boiling water and cut into large pieces. Don't forget to remove the bones. Slices of watermelon gently lay into the banks. It is not necessary to stamp their hands, podrachivaya slightly better Bank that they were located as closely as possible to each other. Pour into jars with watermelon boiling water and leave for 5-10 minutes. Then drain it, boil again and fill jars. After 5 minutes, again drain the water in a pot, add salt, sugar and boil. The last time pour the boiling brine into the jar. Previously, add one tablespoon of vinegar. After the third fill jars with watermelons immediately sealed sterilized metal lids. To check the tightness of the banks turn it upside down and place it on a flat surface lined with paper. After some time, making sure that lids do not leak, wrap cans with a thick cloth to cool. For those who do not want to mess with the banks, will come the recipe of fast preparation of salted watermelon. Pre-cook the brine. To do this in 2 liters of water, add 3 tablespoons of salt, boil and let cool to room temperature. Carefully washed the watermelon cut into pieces, put in a saucepan and completely cover with brine. 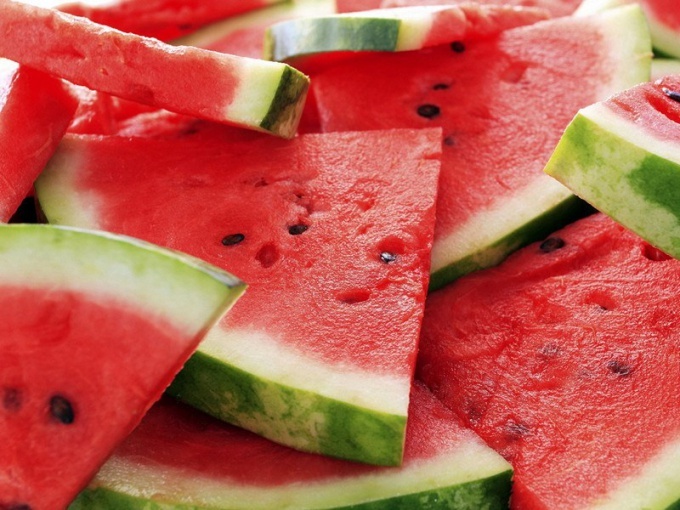 To the slices of watermelon does not pop up, giving the weight of their – a clean plate on which to put a jar of water. Watermelon will sasalita at room temperature after 2-3 days, the warmer the room the faster this will happen. The optimum temperature is 18-22 degrees. Ready watermelon stored in the refrigerator of brine, preventing the formation of mould. Watermelon can be salted, not cutting off the green rind, if you have grown it themselves and are confident in its security. Have purchased same watermelon is best cut along with white pulp, because it collects a large part of nitrates. 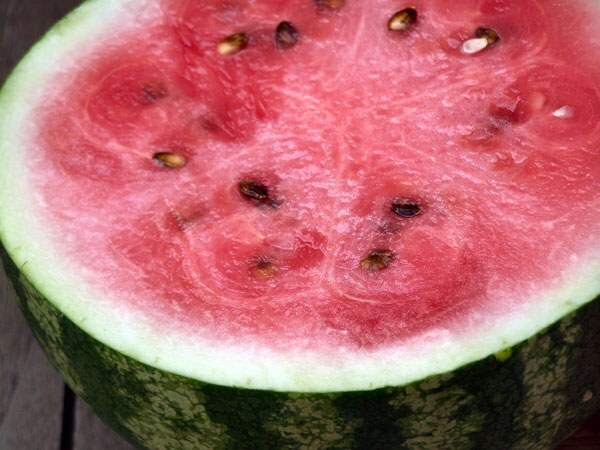 varieties of watermelon with thin skin are preferable to those with thick crust. Some of you may not know that sugar and juicy watermelons can be salted for the winter, thereby obtaining a great snack. Take into consideration recipes harvesting watermelon and surprise your guests with unusual dish. This method of salting you will need ripe watermelons, which should be washed carefully and cut the top part of the red pulp. Slice the watermelon into rounds with a thickness of about two centimeters. Each circle is cut into sectors, so that they easily pass into the neck of the jar. Gently, layer by layer, lay the slices of watermelon in a jar. Fill them with boiling water, cover and steep for ten minutes. Then drain back into the pan and boil again, adding 30 grams of salt and 15 ml of vinegar 9% in one liter of water (if you use brown watermelons pickles, then you can add to the brine 20 grams of sugar per liter of water). Pour the prepared watermelon pickle to the edge of the jars and hermetically ocuparte. Cover with inverted cans watermelons with a warm blanket and a day later put them in a cool and dark place for storage. For pickles this way, you need to use quite ripe watermelons late varieties, uniform in size, not cracked and not overripe. Average weight of watermelon for pickling in barrels should not exceed two pounds. Thoroughly wash the watermelon and put each of them in ten or fifteen places using wooden needles, because of this they are better saturated brine, and will accelerate the fermentation process. In a pre-prepared, thoroughly cleaned and dried the barrel put a small watermelon and pour the hot brine. To prepare ten liters of brine is necessary to take 800 grams of salt. Do not have to shift the watermelons spices, appetizer and so it will be excellent. Filled with pickle barrels drive in wooden stoppers with fabric strips. Keep the watermelons in the cellar, basement or glacier. After two or three weeks, pickled watermelon will be ready to eat.